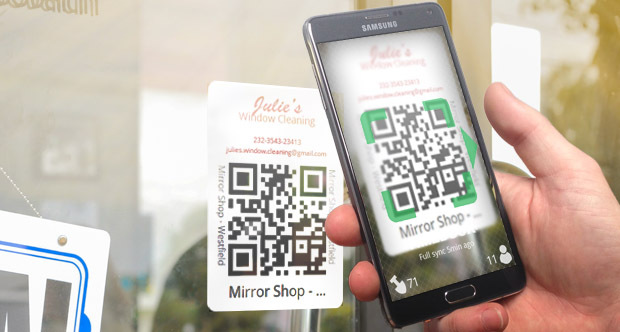 Get your cleaners to check in, using QR codes, for online timesheets and jobs done. Get your cleaners to 'tag in' with TimeDock's mobile time card app for Android and iOS. Create your own task or job barcodes from your TimeDock dashboard. Print them and stick them to different locations for employees to check in. Review Timesheets and job information online. Don't waste time collecting and inputting timesheets ever again! Barcode or NFC. Print barcodes for scanning with mobile camera, or use NFC for proximity clock-in with the latest NFC-capable Android phones. Perfect for small jobs. Setup tasks as re-usable job barcodes. Each time a cleaner arrives they scan in to create a new line in the job sheet. Job costing. Assign a basic labour cost to your employees and get job costing, based on hours worked, for cleaning jobs done! Timesheet view for payroll. Instant online timesheets for staff payroll! Scalable & efficient. Print job barcodes for hundreds of locations and streamline time & attendance data capture for your cleaning business.